Hello I have database on which user work. I want to create copy of this database for testing purpose. Can anyone tell how can this be done? I tried everything from copy a database within SQL Server Express? But Copying files and attaching it destroys first database and trying to restore backup into new database throws error that database is not the same. Can anyone suggest me solution? The file 'C:\Program Files\Microsoft SQL Server\MSSQL11.SQLEXPRESS\MSSQL\DATA\Equipment.mdf' cannot be overwritten. It is being used by database 'Equipment'. File 'Equipment' cannot be restored to 'C:\Program Files\Microsoft SQL Server\MSSQL11.SQLEXPRESS\MSSQL\DATA\Equipment.mdf'. Use WITH MOVE to identify a valid location for the file. The file 'C:\Program Files\Microsoft SQL Server\MSSQL11.SQLEXPRESS\MSSQL\DATA\Equipment_log.ldf' cannot be overwritten. It is being used by database 'Equipment'. File 'Equipment_log' cannot be restored to 'C:\Program Files\Microsoft SQL Server\MSSQL11.SQLEXPRESS\MSSQL\DATA\Equipment_log.ldf'. Use WITH MOVE to identify a valid location for the file. The file 'C:\...' cannot be overwritten. It is being used by database 'Equipment'. Explanation: Don't use filenames of files you already have! If this works, please also opvote Nadeem_MK's answer, as this is basically what he was saying. I just don't have enough reputation yet to comment on his answer. Take backup of your primary database. Create new database with whatever name you want to give it for testing. Restore backup of your primary database to your newly created testing database. Note: The functionality below is not available in SQL Express I have left the answer here for completeness for future readers only. The simplest method I can think of is to let Management Studio do all the work! 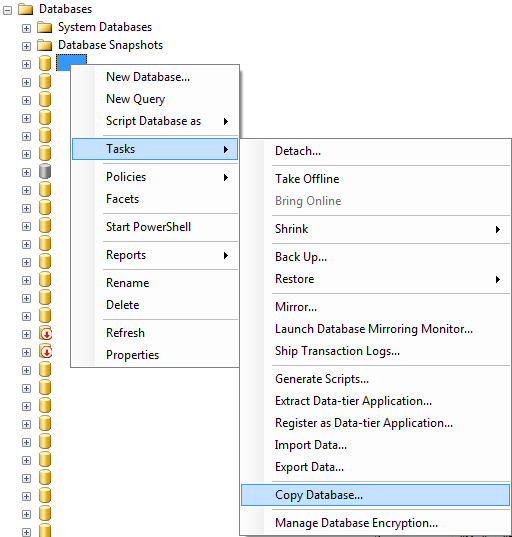 Right-click the database you wish to copy and look for the Copy Database... option under the Tasks menu. Why don't you script the database and run the script? Not the answer you're looking for? Browse other questions tagged sql-server database sql-server-2012 or ask your own question.